Today I want to walk you through the website and the community that transformed me into the trader that I am today, Forex Robot Nation. There’s many ways you can utilize this website to your advantage, and that’s what I like about it most. If you are an avid market watcher like myself, it’s important to have a review website with an active community like this one so you know exactly what traders are using in the current climate. The website is run by PatrickFX, a trader with over 15 years of experience in the Forex marketplace. In 2009 Patrick decided that he would take part in the automated trading boom, and hasn’t looked back since. 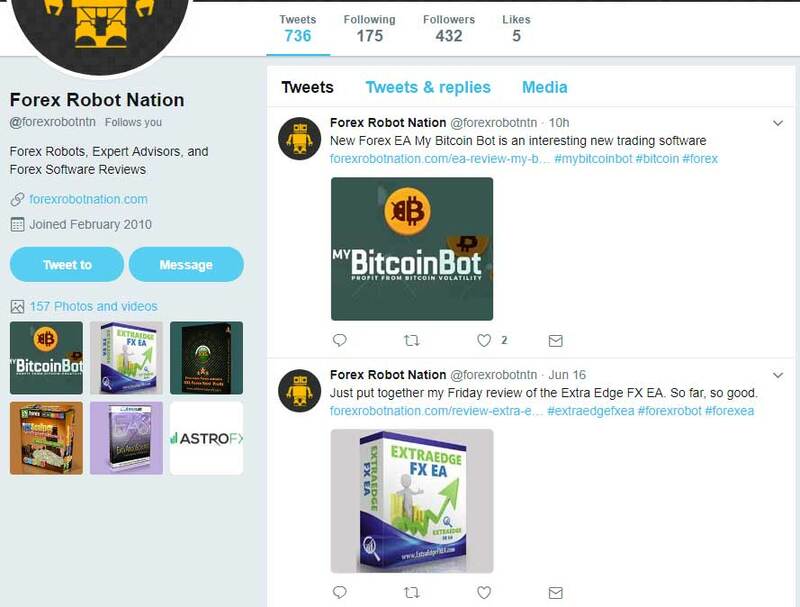 While the majority of trading robot review sites have fell off, Patrick has continued to run Forex Robot Nation because he truly believes in automated trading and has discovered some of the most popular Forex robots ever to be used by the trading community. The Forex Robot Nation website offers so much to the Forex trading community. They pride themselves on providing actual tools and content that will help traders achieve new levels of success, and I’ve personally been rewarded by this fact. They release a new review every 24 to 48 hours, so there is always new content to consume. The majority of the reviews are on Forex robots an expert advisors but they will also include binary options systems, Forex indicators, Forex Mentor groups and anything else Forex trading related. When the website first started, it was focused solely on Forex robots, but over time it’s developed into a much larger and more effective entity. There are 5 main pages that I visit frequently on the Forex Robot Nation website. First of all, you can’t look past the front page of the website. The first page is excellently crafted because it has the top 3 highest rated trading systems right at the top, followed by all the latest news and Forex robot trading. 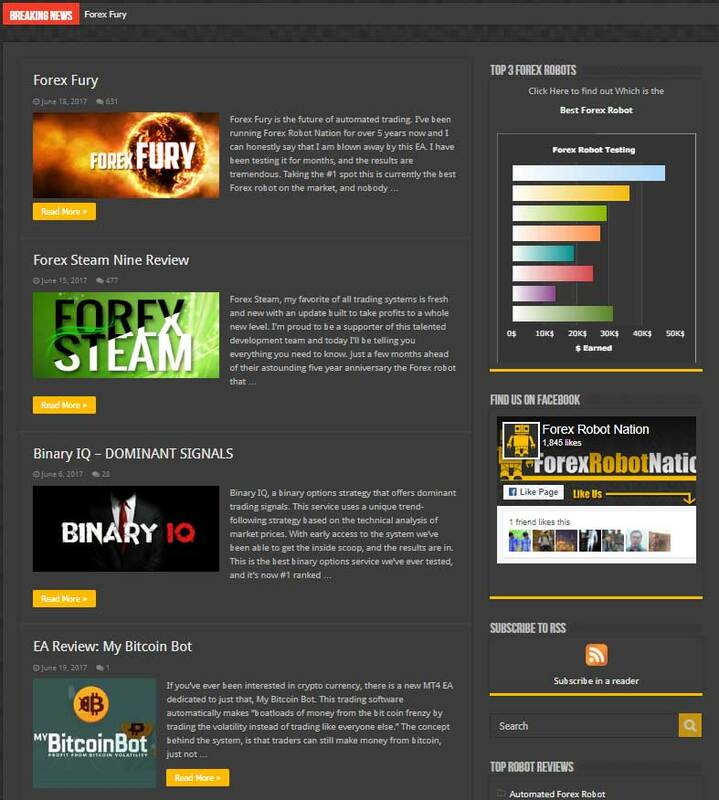 I really like that they keep products like Forex Fury and Forex Steam at the top of this page, because it keeps me involved in the conversations being had by current traders that are always looking for new ways to profit and grow their accounts. Then, of course the Best Forex robot tests page keeps me up to date on what PatrickFX is currently using, and the same goes for the Best Forex brokers page. The members area is what got me started in Forex, but I’ve since found that it hasn’t been updated in a while. The Free robot still works though, and it’s a great way for traders to dip their feet in the water and get a taste of automated Forex trading in MT4. Forex Fury and Forex Steam are the two main trading systems that I subscribe to, so I can never get enough information on all the tweaking and testing. Traders are always playing with the different functions, and features to create new strategies, and if you spend the time to read these comments, you will be able to have some pretty outstanding months. 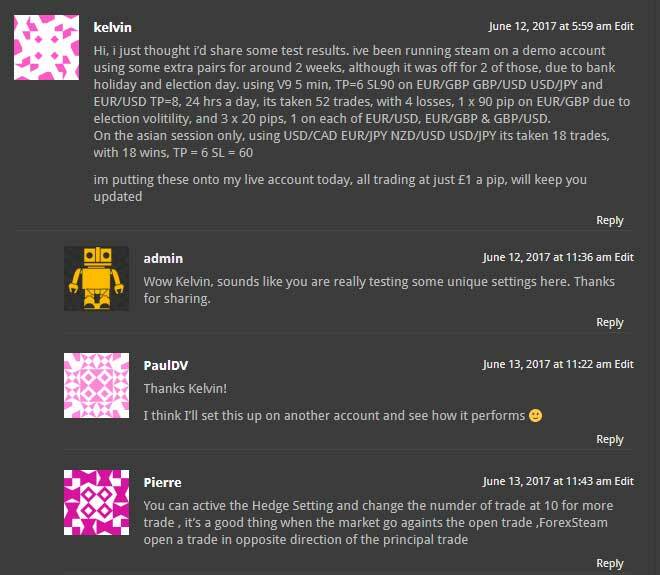 This is a recent conversation in the Forex steam review comments section, that shows traders are testing different pairs and sharing their knowledge with the rest of the community. I can’t tell you how many times I’ve gone into the comments section of a Forex robot review and come out with a new trading strategy that makes me steady profits for a few months. The point I’m trying to make here, is that you need to take advantage of the resources right in front of you. Forex Robot Nation has done such an incredible job at putting together like-minded individuals focused on growing their Forex trading accounts using expert advisors. If you utilize this information properly, you can easily automate your trades and grow your accounts. Just don’t forget to check back from time to time to see what’s new and what’s working for the community in current market conditions. This testing process is probably the best thing offered on the entire website, and it’s just developed naturally over time. Forex Robot Nation also has a very strong social presence. You can find daily updates on Facebook, Twitter, and their YouTube channel. All of which have thousands of subscribers, and active users discussing Forex robots. I don’t spend too much time with the social networks myself, but I understand that it is a very helpful way to reach out to the community. I do like seeing the latest posts pop up on my Facebook feed, because it’s a reminder that I need to get off of Facebook and focus more on my trading. I do like the YouTube channel as well, but I notice they haven’t done a video and the last couple of months. So I’ll probably email PatrickFX and tell him that I miss his voice! If you are interested in automated trading, Forex is the only market that has sustained success in this regard. In 2009 there was a huge boom where the Internet was essentially going Forex robot crazy. During this time, there were marketers galore trying to push trading systems and collect easy profits from a gullible and naïve Forex trading community. This left a lot of people with the sour taste in their mouth, but in the end it was all worthwhile. Now, almost 10 years later Forex robots are better than ever and helpful websites like Forex Robot Nation have stuck around to help develop and enhance automated trading for everyone.